A lack of affordable and effective testing and screening procedures mean surprisingly little is known about the health hazards of many of the tens of thousands of chemicals in use in the world today. The recent rise in the number of children affected by neurological disorders such as autism has stirred valuable debate about the role chemicals play in our daily life, highlighting the need for improved methods of assessing chemicals for developmental neural toxicity. Current methods of testing chemicals for developmental neural toxicity include animal testing with rats or mice and in vitro testing using cultured primary cells or cell lines. Here, we review the current state of neural toxicity screening, analyze the limitations of these methods and, under the National Institutes of Health's new Microphysiological Systems initiative, describe a human pluripotent stem cell-based platform for developmental neural toxicity screens. There is an urgent need for effective, predictive neural developmental toxicity screens both for drug candidates and for chemicals intentionally (for example, cosmetics) and unintentionally (for example, pesticides) coming into contact with the human body [1–3]. The European Union's 2006 Registration, Evaluation, Authorization, and Restriction of Chemicals regulations aim to assess the toxicity of all chemicals sold in Europe in quantities of more than 1 ton per year. As of late 2009, 143,835 chemicals were listed as meeting this threshold . However, the United States has no database of all chemicals in commerce and thus actual numbers are unknown. In addition, of the 3,000 chemicals categorized as high production in the United States (that is, >1 million pounds per year), only 7% have been comprehensively evaluated for toxicity as of 1998, largely due to the high cost of multigeneration animal studies and the lack of alternative testing methods . In the United States, the US Environmental Protection Agency's ToxCast and v-Embryo projects, and the US Environmental Protection Agency/National Institutes of Health (NIH)/US Food and Drug Administration's collaborative Tox21 project all seek to develop more rapid chemical and drug testing methods [6, 7]. Yet it remains imperative to increase the representation of human cellular differentiation models in these in vitro screening efforts. Under the new NIH Microphysiological Systems initiative, we are developing human predictive neural developmental screens of broad use for pharmaceutical and chemical industries that will complement previous toxicology efforts. Current methods of developmental neural toxicity testing fall into two categories with unique limitations: in vivo testing using laboratory animals, and in vitro testing using cultured cells. Laboratory animals have long been used as human surrogates for testing the neural toxicity of chemicals. The most widely used animal for this purpose is the rat, and then to lesser degrees the mouse, rabbit and dog. In developmental neural toxicity tests, chemical exposure starts early in pregnancy and ends weeks after delivery . The toxic effects of the chemicals are then evaluated by standard neurological testing of the pups and by analysis of histological tissue sections of the pups' neural tissues . Although these studies can be informative, the reported concordance for developmental/reproductive toxicity testing between different animal species (typically rat and rabbit) is only about 60% , and there is no evidence that the concordance between either species and human toxicity is any better. A good example of this is the chemical thalidomide, which causes birth defects in humans but has little effect in rats . In addition, because of species-specific differences, subtle cognitive changes and human conditions with no known counterparts in animal behavior (for example, autism) are particularly difficult to model in animals . Finally, the cost of multigeneration animal studies is considerable (>$1 million/study). Animal testing is projected to account for a staggering 70% of the European Union's 2006 Registration, Evaluation, Authorization, and Restriction of Chemicals cost of evaluating a new chemical, and to consume an average of 3,200 rats per chemical . Performing chemical screens on in vitro human models is another method of developmental neural toxicity testing. Currently, however, no in vitro human models are in widespread use for assessing developmental neurotoxicity. A few studies have examined the effects of toxins on human fetal-derived neurospheres. Human central nervous system neurospheres of fetal origin include stem cells, neurons, and astrocytes that self-assemble into structures which recapitulate some early neural developmental events , providing rare access to the developing human neural system. However, these neurospheres lack microglia and vascular cells and therefore do not represent the entire repertoire of cell-cell interactions comprising the brain. They are also hard to obtain in large quantities, making large-scale chemical screens impractical. Furthermore, individual differences between donors may introduce variations between screenings, potentially complicating downstream data analysis. Human embryonic stem (ES) cells and induced pluripotent stem (iPS) cells, which have unlimited proliferative potential, provide a more practical option for building in vitro models [12–14]. The efficient derivation of neural cells from human pluripotent stem cells is now possible, paving the way for recent reports of developmental neural toxicity testing on human ES cell-derived neurons [15–18]. However, the number of toxins examined in these studies has been extremely small (typically one to four) and the types of cells included in the screen have been limited [17, 18]. The value of these model systems to actually predict neural toxicity in wider chemical screens remains to be examined. Under the NIH's Microphysiological Systems initiative, we are building a platform for developmental neural toxicity testing on a physiologically relevant human model. A combination of stem cell biology, tissue engineering and bioinformatics, this platform is capable of meeting the needs of large-scale chemical toxicity screens (Figure 1). Platform set-up diagram. (a) Neural and glial progenitor cells are assembled on a three-dimensional (3D) vascular network formed by endothelial cells, pericytes, and microglia in poly(ethylene glycol) hydrogel to promote the formation of stratified neural epithelium with a vascular network. (b) The neural vascular assembly from (a) will be exposed to a training drug set. 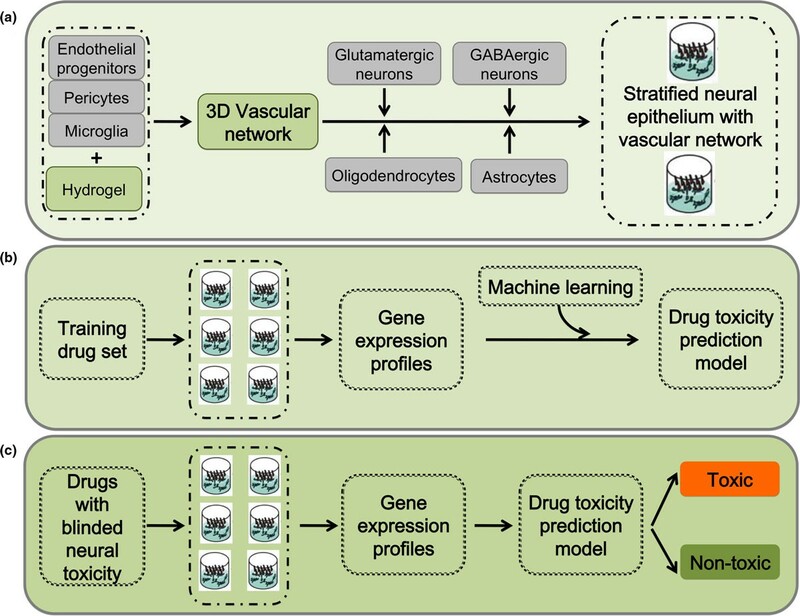 The gene expression profiles from the training set will be used to establish a drug toxicity prediction model using a machine learning algorithm. (c) The model established in (b) can be used to predict the toxicity of an unknown chemical. A central characteristic of our platform is that a remarkable degree of self-assembly, differentiation, and maturation occurs if appropriately specified precursor cells are brought together in the right environment. The most impressive experimental example of self-assembly is the formation of teratomas by ES cells and iPS cells. If allowed sufficient time to develop, these teratomas form well-developed, highly stratified neural structures that closely recapitulate early brain development , and form other advanced structures requiring complex inductive interactions between germ layers, including gut, teeth, and hair . The differentiation and self-assembly of polarized cortical tissues, including ventricular, early and late cortical plate, and Cajal-Retzius zones, has also been demonstrated previously from the in vitro culture of ES cell-derived aggregates, a significant finding for our platform . To create these physiologically relevant three-dimensional structures, we embed human ES/iPS cell-derived endothelial cells, pericytes, and primitive macrophages (microglial precursors) into tunable poly(ethylene glycol) hydrogels displaying specific peptide motifs that promote capillary network formation (Figures 1a and 2). We then overlay this mesenchymal layer with neural and glial precursors to mimic in vivo cephalic mesenchyme-neural epithelial interactions, both to promote the formation of the polarized layers of the cerebral cortex and to allow the formation of endothelial networks with blood-brain barrier properties (Figure 1a). Poly(ethylene glycol) hydrogels have found widespread use in three-dimensional cell culture due to their ease of processing and biocompatibility . Cells can be readily encapsulated within these gels using photo-polymerization [22–24] (Figure 2a), providing a simple mechanism to generate hydrogel arrays with well-defined local spots directly amenable to high-throughput screens. A key prerequisite of this approach is a consistent and scalable source of correctly specified precursors. Recent progress in deriving neural, glial, and vascular precursors from human pluripotent stem (ES and iPS) cells [25–29] provides this scalable source for the first time. Poly(ethylene glycol) hydrogel supports extensive vascular network formation. (a) Schematic diagram of poly(ethylene glycol) (PEG)-hydrogel setup using photo-polymerization. (b) Fluorescent image showing extensive vascular network formation by endothelial cells (CD31+; red) and pericytes (SM22+; white) encapsulated in PEG hydrogel. The nature of developmental timing poses perhaps the most significant challenge to this project. The timing of human ES/iPS cell differentiation largely recapitulates the timing of normal human fetal development. Although it is possible to set up cultures of differentiating human cells that interact for 9 months or longer, such culture systems would not be practical for high-throughput drug screens. Our strategy, then, is to predifferentiate the early precursors of the components of the cerebral cortex in large, defined batches, cryopreserve them, and later combine them into three-dimensional hydrogel assemblies, allowing those assemblies to interact and further mature for a more limited time during drug exposure. Optimized screen readouts and machine learning tools are also important components of this platform. Our basic premise is that toxicants change the basic physiology of cells, and that these changes directly or indirectly cause changes in gene expression profiles that can, in turn, be used to classify specific classes of toxicants. The three-dimensional neural/glial/vascular assemblies, which initially consist of seven cell types, are complex; with further maturation, additional cell types or subtypes may also emerge. Because the specific targets of a novel toxic agent will be unknown and could be as diverse as the ensemble of molecules contained in these assemblies, readouts must reflect this complexity and have a substantial dynamic range, as minor alterations in the assemblies' cellular subcompartments may reflect relevant in vivo toxicity. Importantly, the recent dramatic fall in the cost of high-throughput sequencing makes a readout based on expression profiling very desirable for drug screening purposes, as RNA-Seq allows the monitoring of complex samples with an excellent dynamic range and at a reasonable price per sample. This desirability of using gene expression profiling to better understand toxic responses is shown in recent reports using ES cell-based and other cellular models [30–33]. The platform's final component, a machine learning algorithm, uses the gene expression profiles of cells exposed to known developmental neural toxins to predict the neural toxicity of chemicals without previous toxicity information (Figure 1b,c). In short, we combine the developmental potential of human pluripotent stem cells, the modular nature of the tunable hydrogels, and the discriminatory power of machine learning tools to create a highly sensitive model suitable for large-scale predictive developmental toxicology screens (Figure 1). This platform, and other NIH Microphysiological Systems, should provide a better understanding of chemical impacts on human health. This work, and the publication costs of this article, was funded by NIH grant 1UH2TR000506-01 (to JAT). JAT is a founder, stockowner, consultant and board member of Cellular Dynamics International (CDI), and serves as scientific advisor to and has financial interests in Tactics II Stem Cell Ventures. The remaining authors declare that they have no competing interests.